Say, Do You Like Dirty Girls? 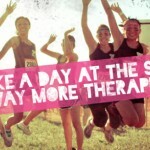 No, for real: Dirty Girl is a series of mud runs and obstacle courses targeted specifically at women. Why, if there’s PMS… and please tell me we are talking about my facial cheeks? Seriously, though: if I were to do one of these, I’d like it to be a women-only run. For me, women-only events are a great way to ease into a sport. First half marathon? A women-only race may provide you with a better experience altogether (better swag, massages or facials at the finish line, champagne, chocolate, and so on). My first triathlon, if/ when I ever do one, will probably be women-only too. Less intimidating this way! Back to the Dirty Girl stuff: there is one coming up on February 2 in San Francisco, and they need volunteers. a free entry into a wave start after your volunteering shift is over! Oh, and for you 49ers fans: the run is at Candlestick Park. The day before the Super Bowl. Karma, or what? If you want to join in the fun and cheer on, then run with a bunch of fierce, fearless (and, ultimately, very dirty) ladies, all you need to do is fill out this form. Be sure to select a volunteer shift that starts early in the morning (6 a.m. or 7 a.m.), so there is time for you to run the course as well. And let me know if the comments if you’re coming: we should meet up! It rained all day today, so I gave myself a sissy card and hit the gym after work. Man, it was packed! Who knew all these people worked out between the hours of 6:30 and 8 p.m.? I felt guilty for taking a treadmill for more than an hour, but at least it wasn’t three hours. Anyway… this one had a time limit of 40 minutes (+ 5-minute cooldown), so I did two “splits”: first 5.29 miles at an 8:30 min/mile and the rest, at a much slower 9:21 pace. Notice how I ran not an inch longer than the required eight miles. That is how much I enjoy the dreadmill. Hey Aleks – I’d love to meet you! I’ve been beginning to get into running again after years off. 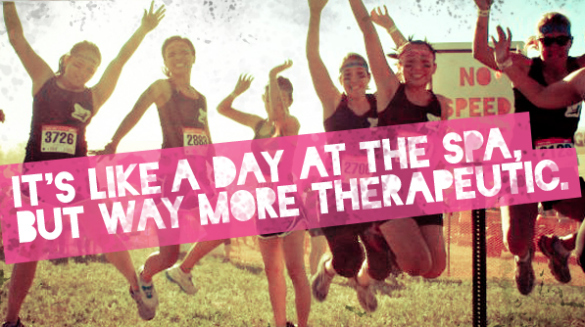 I’ll be volunteering in SF for Dirty Girl. Hey Nicole – absolutely! Which shift did you sign up for? Send me an email (on my “contact” page) if you want to and we can figure out the details!